(på konserter i Norge medvirker også poeten og forfatteren Erling Kittelsen med sine egne gjendiktninger av Jelaluddin Rumi til norsk). 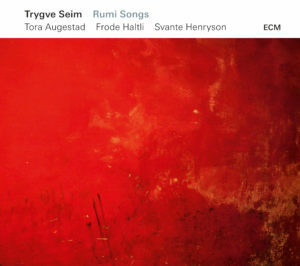 “Rumi Songs” is both the name of a song cycle composed by Trygve Seim with the poetry of persian mystic Jelaluddin Rumi (1207-1273) in english translations by Coleman Barks and Kabir and Camille Helminski., but “Rumi Songs” is also the name of Trygve Seim‘s quartet performing these songs, plus the name of Seim‘s CD released by ECM Records August 2016, presenting these songs. The Rumi Songs CD is produced by Manfred Eicher and recorded in Rainbow Studio with sound engineer Jan Erik Kongshaug. Cover art by Sacha Kleis (design) and Knut Bry (photos), with liner notes by Steve Lake. There are encounters that change everything. In the autumn of the year 1244 in the Anatolian city of Konya, a dervish named Shams Tabriz came crashing into the disciplined life of theologian Jelaluddin Rumi. Accounts vary. Some say that Shams, grabbing the bridle of Rumi’s mule, demanded to know whether Mohammed or the Sufi ascetic Bastami was the greater servant of God, a provocative question in the 13th century (and doubtless today, at some addresses). In other legends, Shams finds Rumi sitting at a fountain surrounded by a group of his students, and tosses their books into the water, with the impatient implication: you’ve read enough about the spiritual life, start living it. Rumi is famously kind and tolerant, but the impulsive Shams declares himself bored with gentleness. The two of them get along like a house on fire. For three years they are inseparables, debating intensely about the meaning of the universe and man’s place in it. Then, suddenly, Shams disappears. Was he murdered by jealous students, or even by Rumi’s own family? Did he simply leave town, having fulfilled his job as turbulent muse? No one knows. Rumi, bereft, pours his energy into poetry, writing more than forty thousand verses to form The Divan of Shams of Tabriz, and crediting his vanished friend as its author. By now he can’t tell where his own thoughts end and Shams’s begin. A question of authorial identity hovers around translations of Rumi, too. Some writers, including the late Idries Shah, who incorporated tales from Rumi into his popular collections of Sufi teaching stories, have contended that Rumi’s poetry can only be appreciated in the original Persian. Nonetheless many translations have been made from his vast poetic output, beginning in the 19thcentury when parts of magnum opus The Masnavi first began appearing in English and in German, and fired the imaginations of admirers including Hegel and Goethe. With no thought, initially, of publishing, Barks strove for seven years to reset Rumi creatively in the American free verse tradition of Walt Whitman and William Carlos Williams, unhampered by his lack of Farsi. Sometimes he consulted with linguistics professor John Moyne and sometimes he didn’t, instead paraphrasing liberally from primary translations to shape his own interpretations of Rumi. With the book Open Secret in 1986, Barks’s “versions” went public, and met with an immediate response from readers. The book won prizes and, seven centuries after the death of the Sufi poet, a new Rumi boom gathered momentum. Barks’s anthology The Essential Rumi has sold more than a quarter of a million copies, a startling figure for poetry, let alone variations on the 13th century mystical strain. Rumi has never been read more widely, certainly not in the West. Seim was at once taken with Barks’s lines, some of which seemed immediately to imply melodies. 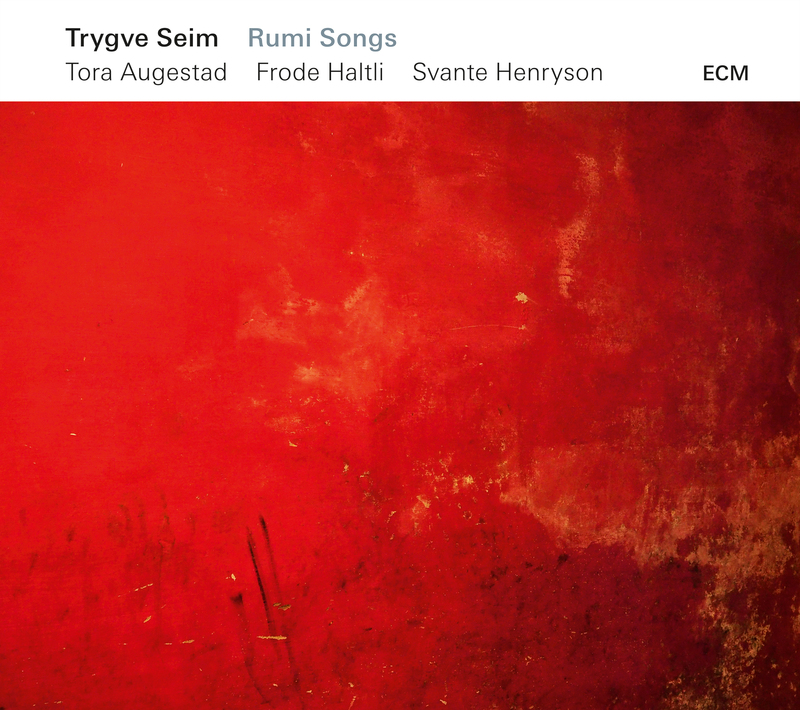 The first of Trygve’s Rumi songs were “On The Day I Die” and “There Is A Way Between Voice And Presence”. Though neither of these is included in the present disc, they set a direction for the work to be done, and “On The Day I Die” has since been arranged for many different instrumentations, including a large scale version with Tora Augestad and the Cairo Symphony Orchestra. If the tag line of “Across The Doorsill” – “Don’t go back to sleep/Don’t go back to sleep” – seems to have a Gurdjieffian flavour, very much in the spirit of the Armenian philosopher’s declaration “better to die than to live in sleep”, this may be because Gurdjieff was influenced by Rumi and by the music and dance of the Mevlevi dervishes. There are reports of Rumi’s Masnavi being read aloud at Gurdjieff’s Institute for the Harmonious Development of Man in Fontainebleau, and the Gurdjieff “Movements” and “Sacred Dances” have a clear relationship to the Mevlevi ceremony of Sema, the turning and spinning associated with Mevlana’s whirling dervishes. Trygve Seim travelled to Konya in 2007 to visit Rumi’s tomb and to witness the annual celebration of his life and subsequent ‘return’ to the Creator. The instrumental piece “Whirling Rhythms” reflects on the journey. Brief as it is, it’s also a powerful illustration of the rapport between Trygve and accordionist Frode Haltli. Drafted into Trygve’s large ensemble originally as a substitute for Stian Carstensen, Haltli has gone on to become one of the most important contributors to Seim’s music, bringing with him profound knowledge of contemporary composition (composers including Bent Sørensen and Hans Abrahamsen have written music especially for him) and an improvisational capacity with deep roots in folk music. “From the first time we played together it felt like a really good match,” says Trygve. Seim and Haltli also perform as a duo, documented on the album Yeraz. The arc of Svante Henryson’s career has found him in both supportive and featured roles across a near-baffling span of idioms. A period as principal bassist with the Norwegian Chamber Orchestra was followed by three years as Yngwie Malmsteen’s bass guitarist. He has played sessions with Ryan Adams and Elvis Costello. As cellist, he has been a chamber music partner to Anne Sofie von Otter, and improvised with Jon Balke and Ketil Bjørnstad. He has composed orchestral, choral and chamber music. Inside the Rumi Songs project he provides an anchoring function and underlines the voice with elegant cello lines. On “Like Every Other Day”, Mevlana Jelaluddin Rumi, author of many thousand poems advises: “Don’t open the door to the study and begin reading/Take down a musical instrument./Let the beauty we love be what we do.” Trygve Seim seems to have taken the advice to heart. Old boundaries of style and genre crumble on “Seeing Double”. In this one – based upon an English Rumi text supplied by Mevlevi Sufi shaikh Kabir Helminski – the quartet skirts the borders of tango, with brilliant soloing by accordionist Haltli and a bouncing pizzicato bassline from cellist Henryson, before the music unwinds in a rubato section with an eastern feeling and a gorgeous, radiant tenor feature for Trygve. Nobody else plays melody like this.